No records have been set for output to the grid from Ontario’s Industrial Wind Turbine over the period, because the grid can’t accept all the supply. My estimates show as much as 6000 megawatts curtailed, or dumped on exporters, during the 2 1/2+ days. Stop romanticizing Arctic development, say indigenous leaders is an article that might shock some cosmopolitan greens. The installation of renewable energy like wind turbine farms is wreaking havoc across Sapmi, the traditional Saami homeland that stretches from Arctic Norway through Sweden and Finland and into northwestern Russia. In Sweden and in Norway these windfarms have destroyed traditional reindeer grazing lands and caused mental and financial issues for the Saami that rely on the animals to make a living. Even today, companies like Fred. Olsen Renewables are planning 72 wind turbines in important grazing and calving lands for the Norwegian reindeer herding districts of Åarjel-Njaarke and Voengelh Njaarke. Despite Saami opposition, the project has been approved by authorities. The article isn’t all negative. Vittus Qujaukitsoq, Greenland’s minister for Finance, Mineral Resources and Foreign Affairs] says. The autonomous territory in the Kingdom of Denmark is rich in uranium and rare earth elements used in everything from cars and airplanes to computer screens and x-rays projects. Australia’s Greenland Minerals and Energy Limited will be exploiting the Kvanefjeld project in South Greenland, something that will create jobs, know-how and much needed infrastructure in this remote region. The mining question hasn’t been without controversy, but the Greenlandic government is convinced that it’s doing things right. Resource extraction is providing much needed economic diversification, especially important when 90 percent of Greenland’s current exports is related to the volatile fishing industry. Learned lessoners produce paper on lessons learned from Ontario Wind energy dispute. A new article by the green clique’s man at the Globe and Mail covers a new paper just published in Nature Energy. Issues concerning the social acceptance of wind energy are major challenges for policy-makers, communities and wind developers. They also impact the legitimacy of societal decisions to pursue wind energy. Here we set out to identify and assess the factors that lead to wind energy disputes in Ontario, Canada, a region of the world that has experienced a rapid increase in the development of wind energy. Based on our expertise as a group comprising social scientists, a community representative and a wind industry advocate engaged in the Ontario wind energy situation, we explore and suggest recommendations based on four key factors: socially mediated health concerns, the distribution of financial benefits, lack of meaningful engagement and failure to treat landscape concerns seriously. 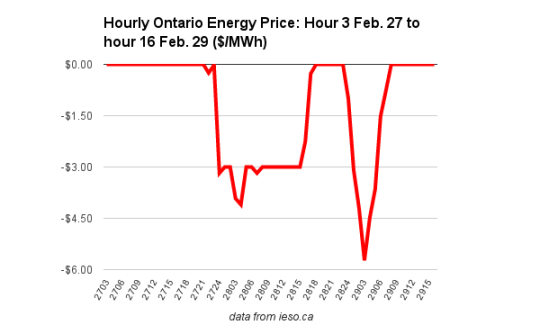 It’s definite Ontarians were lied to about both the cost of wind (high) and the value (negligible at best). It’s also clear who did the lying. If legitimacy could be lost it most certainly must have been lost by now. I made the following comment on reddit attempting to explain why wind and solar growing beyond 20% of our total electricity supply costs doesn’t equate to them only being responsible for a small portion of a large price increase. The impact on residential, and small business, consumers is greater than 20 percent. There are 3 basic consumer groups: exports (which have been getting cheaper), Class A (large Ontario consumers that can escape much of the “global adjustment charge” – and have been relatively stagnant since entering existence in 2011), and the rest of us – either directly as “Class B” consumers or through the regulated price plans that set that rate). When supply is added, price drops, making exports cheaper along with Class A pricing which shifts the costs to Class B consumers. It’s confusing but, by way of demonstrating, the Ministry of Energy wrote in December 2015, “ the average price of electricity generation in Ontario, which in 2015 was $83/MWh.” (8.3 cents/kWh). This month the same data was [reported on] this way. “The total cost of power for Class B consumers, representing the combined effect of the HOEP and the GA, was 10.14 cents/kWh.” The difference of 1.8 cents didn’t exist before 2008. 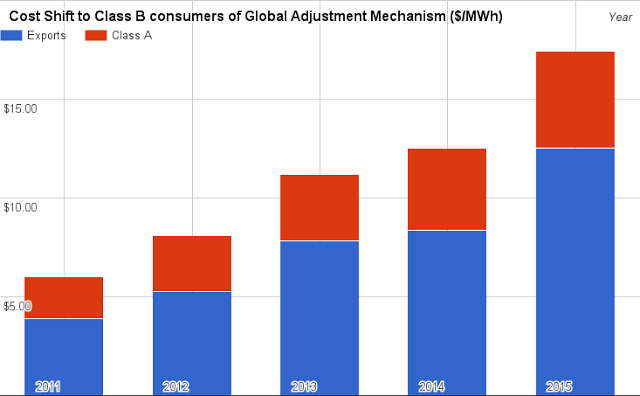 The “Class B” price is up from 5.45 cents/kWh in 2007– an 86 % increase – but in 2007 the average price across all consumer groups was very similar (5.36 cents/kWh). That increase in the cost for smaller, class B consumers, is 30% more than the increase across all markets: the market recovers fewer dollars for exporting nearly twice as much, and since 2011 “Class A” consumers pay a lower share of Ontario’s costs. 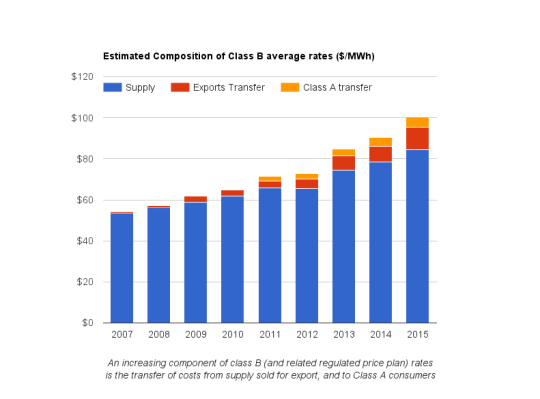 The average cost of power increased by ~3 cents/kWh since 2007, but another ~1.8 cents/kWh hits bills through transfers of costs from exporters and Class A consumers. 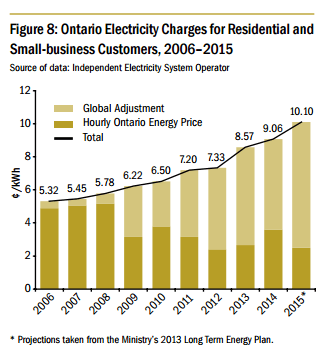 There is this multiplier in the cost to residential consumers of all supply recently added to Ontario, but particularly wind as windy hours drive down the market price, which directs more cost to the smallest consumers. [Auditor general Bonnie Lysyk’s] calculations suggest $9.2 billion in excessive spending on renewables over 20 years — a figure that is, ah, 73.5 per cent higher than what the Independent Electricity System Operator (IESO) came up with. That’s a pretty big spread, plus or minus. Is it a pretty big spread? The lower figure, $5.3 billion, may be a better description of the value today, but it’s more speculative than the $9.2 billion. Regardless, isn’t $5.3 billion a lot of money – particularly considering the discussion is about “excess” spending due to increasing the payment terms in an unnecessarily enriched procurement period? At the end of 2009 no contracts were offered under the newly introduced, expensive, feed-in tariff program. Within 21 months reporting shows offers had grown to 4,528 megawatts of capacity, and a similarly priced 1,070 megawatts were contracted with the Korean Consortium. In the ensuing 4 years those numbers grow a little over 400 megawatts, so just 21 months account for over 90% of the contracting that added maybe only $5.3 billion in excess of the what the cost would have been under the previous, successful, procurement program. It’s a lot of gas plant scandals, but it’s not enough to make certain people sick. The Martin Regg Cohn column I quoted from above followed his appearance of a segment of The Agenda which I wrote critically of. I noted on Facebook my apparent contribution to his growth in understanding of what the $9.2 billion represented. Only $5.3 billion – if you reflect the time value of money. There was an article on Many Canadian sites today written by Keith Leslie of the Canadian Press. Greenpeace Canada said the Green Energy Act is a good tool, but won’t really help if the province sticks to its plan to have nuclear power provide 50 per cent of Ontario’s electricity needs, the same level it currently provides. “What we haven’t heard from the government yet is an actual willingness to expand the deployment of renewables and conservation,” said Greenpeace’s Shawn-Patrick Stensil. The Ontario Clean Air Alliance also wants the government to use the Act to signal a move away from nuclear power. “We’re very concerned the government is still committed to signing contracts for two new nuclear reactors at the Darlington station, and if that happens that will lock Ontario into a nuclear future for at least another 60 years,” said alliance chair Jack Gibbons. TORONTO – Environmentalists want the Ontario government to abandon plans for a $13-billion refurbishment of four nuclear reactors at the Darlington generating station east of Toronto and instead import more electricity from Quebec. “Every single nuclear project in Ontario’s history has gone massively over budget by two and a half times,” said Alliance president Jack Gibbons. Greenpeace Canada, meanwhile, is concerned about the safety and health risks posed by nuclear power generation in the event of an accident, and says refurbishing the aging reactors at Darlington is not worth the risk.“The government agencies mandated to protect the public are helping push the project through by concealing Darlington’s true risks from the public,” said Greenpeace spokesman Shawn-Patrick Stensil. In 7 years Keith Leslie learned nothing from events in Ontario and draws on the same unaccomplished sources to fill paragraphs.